In the run up to this weekâ€™s presidential election, the two major parties have been using various strategies to outwit each other. One of such strategies is the mobilisation of crowds to attend their rallies in various parts of the country, to create the impression that the parties and their candidates are popular. Deputy Political Editor RAYMOND MORDI, who has been following the trend, reports. For instance, Governor Nasir el-Rufai of Kaduna State sought to downplay the essence of the crowd that stormed Atikuâ€™s Northwest campaign in Sokoto, by alleging that the PDP rented the crowd that attended the rally from Niger Republic. El-Rufai spoke while delivering a keynote address at the launch of the campaign council of his party at Murtala Mohammed Square, Kaduna, the following day. In like manner, the PDP Presidential Campaign Organisation (PPCO) also berated the APC National Chairman, Adams Oshiomhole, for making derogatory comments about the partyâ€™s presidential rally held in Owerri, Imo State, on January 22. 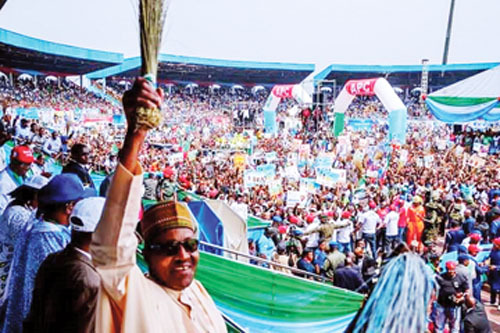 The campaign organisation said Oshiomhole was discomfited that the people of Imo and Nigerians in general are rallying behind its presidential candidate, as well as its governorship candidate, Mr. Emeka Ihedioha, by storming the venue of the rally. The UPP Chairman said the electorate is becoming increasingly conscious and political parties may not be able to get away with the â€œcultural extravaganzaâ€ in the name of campaign rallies. He said: â€œNow, that votes are beginning to count, the issue of crowd mobilisation will play a lesser role in determining who wins the contest. In recent times, we have been hearing so much about vote buying. This is a clear indication that votes are counting. â€œPrior to this time, votes never counted, so the Independent National Electoral Commission (INEC) simply connived with the party in power and declared results and in the process voters were sidelined. The upsurge in vote buying suggests that political parties are now aware that voters matter. â€œIf we take this further by introducing electronic voting, where people can cast their votes from the comfort of their homes and their places of business, then the issue of crowd renting will disappear, because the parties will now be required to engage the electorate and convince them, rather than the cultural extravaganza called rallies today. Nevertheless, it will take some time before the Nigerian electorate becomes fully conscious. Okorie said ruling parties have a way of exploiting their incumbency to gain advantage. He said: â€œThe way I see it, the two major parties have states under their control and this can be very instrumental when it comes to the final day mobilisation of voters. The APC has 20 states under its control and that is quite instructive. â€œBeyond the rallies, when you look at the figures, INEC has given us an idea of what to expect. For instance, the Southwest has 16 million registered voters and the six states in the region are controlled by the APC. Then, in the Northwest, you have 20 million registered voters and six out of the seven states in the region are in the APC as well. So, the regions with the highest number of registered voters ate controlled by the APC. That is a huge advantage and donâ€™t forget that what will determine the winner of this election is a simple majority. Elder statesman, Alhaji Tanko Yakassai, 93, said crowd renting is a new phenomenon. He said during the First and the Second Republic people attend rallies on their own. The former National Assembly Liaison Officer to President Shehu Shagari said: â€œNobody makes arrangement for the transportation of those who attend rallies, but people still go on their own to witness such events. â€œNowadays, nothing is left to chance; the richer you are, the bigger your crowd. In those days, we either trek or go on bicycle or motorcycle. Today, they hire different kinds of vehicles to ferry people to and fro and everybody that attends the rally are paid an allowance for doing so. â€œSo, the crowd you see in rallies today does not necessarily represent the strength of the party. If you study past elections, there has never been a situation where half of the electorate voted. The turnout is usually 30 to 38 per cent or 40 per cent maximum. So, donâ€™t be deceived by the crowd you see at rallies, because they are usually paid for it hired. They are not party supporters or volunteers. â€œDo you know that in 1978/1979, the defunct National Party of Nigeria (NPN) provided flight tickets for its presidential candidate, the late Alhaji Shehu Shagari, and his security details, to go to Sokoto from Lagos, to campaign; he never bought a ticket for himself. â€œToday, it is the candidate that provides money for all sorts of expenses for the campaign. From this, you can see the reason why our democracy is now for sale to the highest bidder.